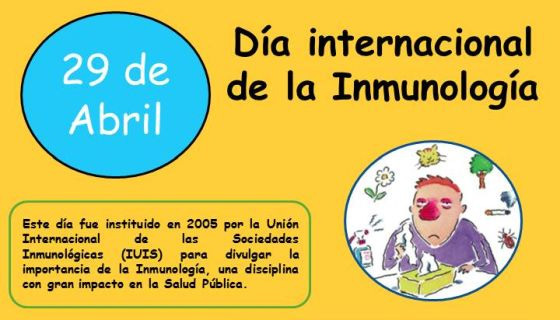 The International Day of Immunology is celebrated worldwide on 29 April with the aim of disseminating immunology among the general public and making this discipline known in its important role in health and disease. The International Immunology Day was instituted in 2005 by the European Federation of Immunology Societies (EFIS) and the International Union of Immunology Societies (IUIS) so that each year Immunology societies promote and disseminate this discipline among Citizenship, highlighting the importance of preventing, diagnosing and treating the diseases that derive from their alterations. This year, the central theme has been devoted to allergies and immunoglobulin E (IgE), to commemorate the 50th anniversary of the discovery of this antibody and its relevant impact on the diagnosis and treatment of allergic diseases. INMUNOTEK has collaborated with the sponsorship of various acts carried out by the Spanish Society of Immunology to commemorate this day.